Great strides have been made in constructing fire-resistant buildings and improving fire-suppression techniques, both of which have reduced the incidence of fire. However, in terms of property losses, these advances have been somewhat offset by increases in the number and value of buildings. In 2017, on average, a fire department responded to a fire every 24 seconds in the United States, according to the National Fire Protection Association. A structure fire occurred every 63 seconds, a home fire occurred every 88 seconds, and an outside property fire occurred every 51 seconds. Fires occurred in highway-type vehicles every 3 minutes and 8 seconds. (1) Including allowances for FAIR Plan and uninsured losses. (2) Calculated by the Insurance Information Institute using ISO property loss and population estimates from the U.S. Census Bureau, Population Division. Source: ISO®, a Verisk Analytics® business; U.S. Census Bureau, Population Division. (1) Estimated. Includes FAIR plan and uninsured losses. The National Fire Protection Association (NFPA) reports that there were 499,000 structure fires in the United States in 2017, up 4.9 percent from 475,500 fires in 2016, which was the lowest number of fires since the NFPA began collecting data in 1977. Structure fires peaked at 1,098,000 in 1977 and have been trending downward over the past 40 years. Fires in structures not related to wildfires caused $10.7 billion in property damage, up 37 percent from the 2016 loss of $7.8 billion. The average loss for these structure fires was $21,442, up 30.5 percent from a year ago. Wildfires resulted in $10 billion in direct property loss in 2017. Public assembly fires include fires in eating and drinking places and other entertainment venues, houses of worship and other places where people congregate. There are approximately 7,600 structure fires in eating and drinking establishments each year, according to a NFPA report based on data between 2006 and 2010. According to the NFPA, fires in nightclubs are among the most deadly public occupancy fires, because they contain a large number of people in one main space. In January, 2013 a deadly nightclub fire in Brazil claimed over 230 lives, making it one of the most deadly nightclub fires on record. The deadliest nightclub fire in world history was the 1903 Iroquois Theater fire in Chicago, Illinois in which 602 people were killed, followed by a 1942 Cocoanut Grove fire in Boston, Massachusetts which claimed 492 lives and a fire at the Conway's Theater in Brooklyn, New York in 1876 which killed 285 people. The 2003 Station Fire in Rhode Island claimed 100 lives, and ranks as number eight. The complete top ten ranking is posted at NFPA: Nightclub Fires. (1) Estimates based on data reported by fire departments responding to the 2017 National Fire Experience Survey. May exclude reports from all fire departments. (2) Excludes $10 billion in direct property damage from the California wildfires. Source: Reproduced with permission from Fire Loss in the United States During 2017 by Ben Evarts, ©2017, National Fire Protection Association https://www.nfpa.org/News-and-Research/Data-research-and-tools/US-Fire-Problem. (2) Includes overall direct property loss to contents, structures, vehicles, machinery, vegetation or any other property involved in a fire. Excludes indirect losses, such as business interruption or temporary shelter costs. (4) Less than 0.1 percent. (5) Includes more than $400 million in large loss fires in apartment buildings under construction. (6) Includes hotels and motels, college dormitories, boarding houses, etc. (7) Excludes incidents handled only by private brigades or fixed suppression systems. (2) Includes hotels and motels, college dormitories, boarding houses, etc. (3) Includes public assembly, educational, institutional, store and office, industry, utility, storage and special structure properties. (4) Includes trains, boats, ships, farm vehicles and construction vehicles. (5) Includes outside properties with value, as well as brush, rubbish and other outside locations. (6) Less than 1 percent. (1) Fires that kill five or more people in residential property, or three or more people in nonhome or nonstructural property. (2) Fires with the same number of deaths receive the same rank. Source: Reproduced with permission, based on data from Catastrophic Multiple-Death Fires in 2017 by Stephen G. Badger, © 2017, National Fire Protection Association https://www.nfpa.org/News-and-Research/Data-research-and-tools/US-Fire-Problem. (1) Fires that kill five or more people in home property, or three or more people in nonhome or nonstructural property. (2) Revised to 2,976 by government officials. March 25, 2011, marked the 100-year anniversary of the Triangle Shirtwaist Factory Fire. The blaze that swept through a New York City sweatshop killing 146 garment workers ushered in a new era of fire safety in the American workplace, according to the National Fire Protection Association. The September 11, 2001, World Trade Center conflagration was the deadliest, as well as the most costly, building fire in U.S. history. (1) Based on deadliest single-builiding or complex fires and explosions. Almost half of all reported fires on July 4th were started by fireworks between 2009 and 2013 (latest data available), according to the National Fire Protection Association (NFPA). In 2017 U.S. hospital emergency rooms treated an estimated 12,900 people for fireworks related injuries; 31 percent of those injuries involved injuries to hands and fingers, 22 percent involved the head, face and ears, 17 percent involved legs, 14 percent involved eyes, and 6 percent involved arms according to the Consumer Product Safety Commission. The risk of fireworks injury, based on the estimated rate of emergency department-treated fireworks-related injuries, is highest for children 10 to 14 years of age (5.9 injuries per 100,000 people) followed by young adults 20 to 24 years of age (5.8 injuries per 100,000 people). The National Fire Protection Association (NFPA) says Thanksgiving Day is the leading day for home cooking fires, followed by the day before Thanksgiving and Christmas Day. In 2016, there were 1,570 home cooking fires on Thanksgiving, the highest for any day of the year. U.S. fire departments responded to an estimated annual average of 200 home structure fires that began with Christmas trees from 2011 to 2015, according to a fact sheet from the National Fire Protection Association (NFPA). On average, one out of every 32 reported home Christmas tree fires resulted in a death, compared to an average of one death per 143 reported home fires. Home Christmas tree fires caused an average of six civilian deaths, 16 civilian injuries and $14.8 million in direct property damage annually from 2011 to 2015. Electrical distribution or lighting equipment was involved in two out of five (40 percent) of the home Christmas tree structure fires. About one-quarter (26 percent) occurred because some type of heat source was too close to the tree. Decorative lights were involved in 18 percent of these incidents. 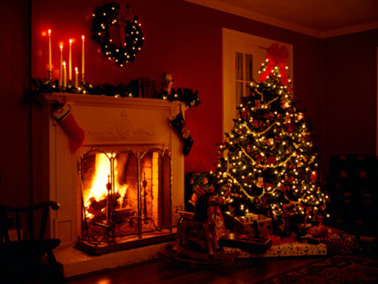 Eight percent of home Christmas tree fires were started by candles. The top three days for home candle fires were Christmas, New Year’s Day and New Year’s Eve, according to another NFPA fact sheet. During 2011-2015, the NFPA estimates that 12 percent of December candle fires began with decorations. These fires caused an estimated average of one civilian death, 41 civilian injuries and $13.4 million in direct property damage per year, according to an NFPA fact sheet. Candle fires peaked in December (11%). January and November ranked second, each with 10% of home candle fires. During the five-year-period of 2011-2015, 8,690 home structure fires were caused by candles each year. They caused an annual average of 82 civilian fire deaths, 800 civilian fire injuries and $295 million in direct property damage.